Back in April I started work on making my Mighty Morphing Goblins mightier. 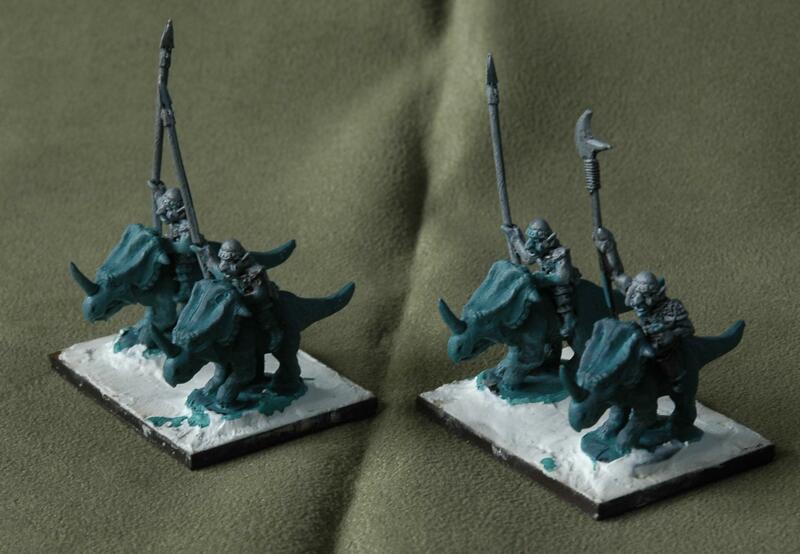 Way back in 2010 I had bought the figures to give them chariots and knights (of sorts) to use for HoTT or for representing armies in DBA that I don’t have, in particular Classical Indians as ‘Classical Goblins’. 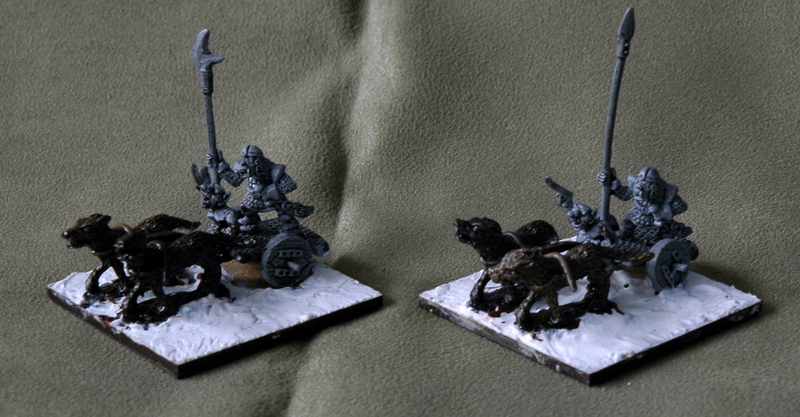 In April I assembled the goblin battle-carts and dinoriders and started painting them. However, at that time I had too many projects on the go, and I ended up packing up all my figures and not painting anything. I did take some pictures of them half-done, and in an effort to get going again, I’ll post them here. 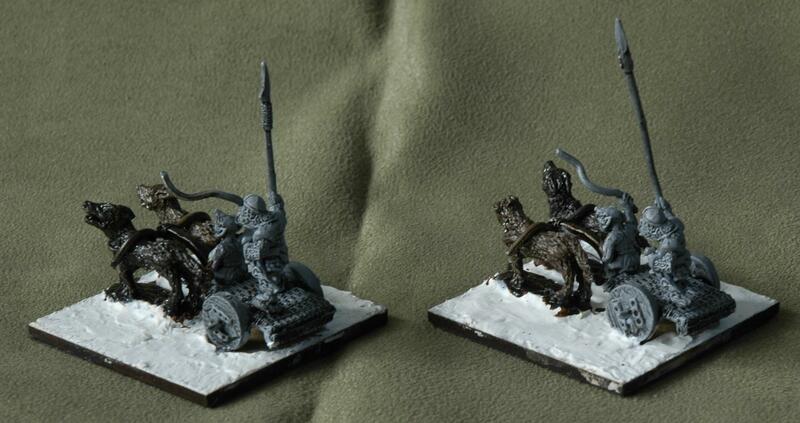 Goblin battle carts from Magister Militum’s Chariot range. The battle carts were provided by Magister Militum; however I’ve used different figures. Instead of an overseer with a whip. I’ve modified a weedy goblin with a long spear into the driver. I also used a hobgoblin with a spear or polearm as the crew instead of an archer. I removed the bases and had the driver sit, as he was already pretty much squatting. I bent the yoke on the cart a lot to get it to sit flat. I’m looking forward to finishing these as they have quite a lot of character. The dinoriders are made from the regular wolfrider figures mounted on dinosaurs of some sort. 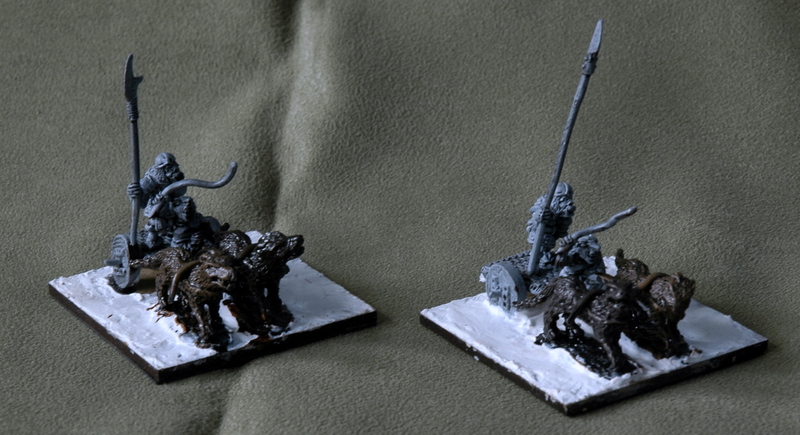 The flesh of the mounts is supposed to be a little gruesome; I’m hoping once I add a bit more colour it will work. 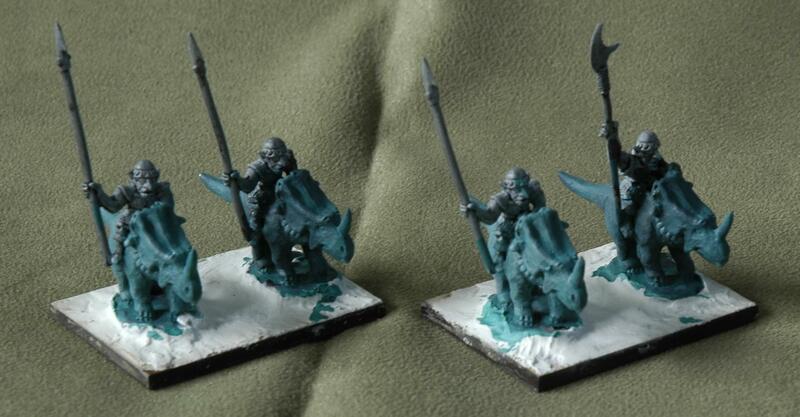 In terms of allowing the Goblins to morph into any army for DBA, the only thing they don’t really have is LH. I’ve used giant spiders, but they’re not ideal. I’ve also got a HoTT stronghold under way that I’ll come back to once these are done. It has quite a few corpses to decorate it! I should get around soon to posting pictures of the rebased Norse Irish, Vikings and Scots Isles and Highlands armies that I finished back in April. Those are nice figures. Do you normally base your figures before you paint them? Thanks. Only big things like chariots and elephants, normally, but there seemed room for the dinoriders, so I did them too. They’re coming on nicely now.